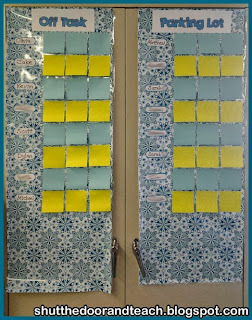 September tends to be all about getting to know my new fourth graders and establishing routines. Now that it's already October, I thought it would be a good time to reflect on all those new, "It seemed like a good idea at the time" tricks that I was excited to pilot at the beginning of the year. Happily most of them are working out well! 1. The Parking Lot: I was thinking of incorporating a Blurt Chart/Parking Lot combo here. However, my class this year does NOT have a blurting problem! 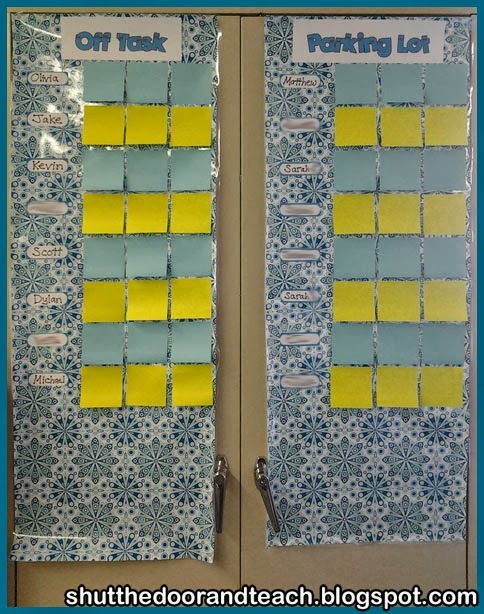 I feel like there is only one student in my class this year who is having trouble staying quiet, (not so much blurting out as talking to other kids at inappropriate times) and because he also has trouble fitting in, having a public chart like this would make matters worse for him instead of better. Instead I use it as a collection of "that reminds me" anecdotes or "I know you're teaching me how to multiply right now but I was just wondering..." type questions. Then, at the end of the day if we have a spare minute or two I can read them off. I like it! I just need to change the top headings; the kids on the left do NOT appreciate being on a poster that says "Off Task!" I told them I didn't really think about it as separate; it's just split so the doors can open, but they make a fair point. Any ideas on what to put at the top (other than stretching out the lettering for Parking Lot)? 2. The Mailbox: This is working VERY well! I used to have bins on my desk, and when I had notices to hand out I'd stick them on top. I don't like to hand out notices until the moment they go into folders, and I don't like taking time out of instruction more than once per day to dig out folders and put papers away. 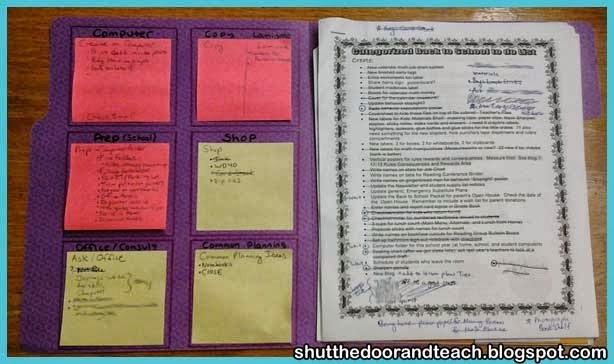 So now that each student has a folder, when kids are working independently, myself or a child who has finished early can put papers into the file folders, which are distributed at the end of the day by group. 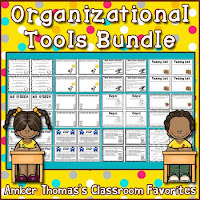 Papers addressed to each child go into their own folder, and notices that are for everyone can be placed 4 at a time into the "group hanging folder" to be distributed at the group. It is working well! The kids love the "You've Got Mail" flag that I simply taped to a ruler (and flip upside down when there is no mail). 3. The Student Work Hallway Display: I'll be honest, this is not a new idea, it's just a good one. 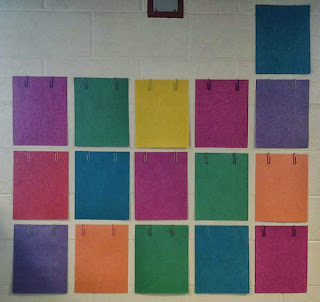 I ask the kids their favorite color on the first day of school, hang contruction paper with 2 paper clips out in the hall, and I have a quick, attractive way to hang and replace student work. No more peeling tape off the back of projects when I want to give them back. And the color give the papers a nice backdrop. 4. A neat desk looks like this! This one is for my kiddos. 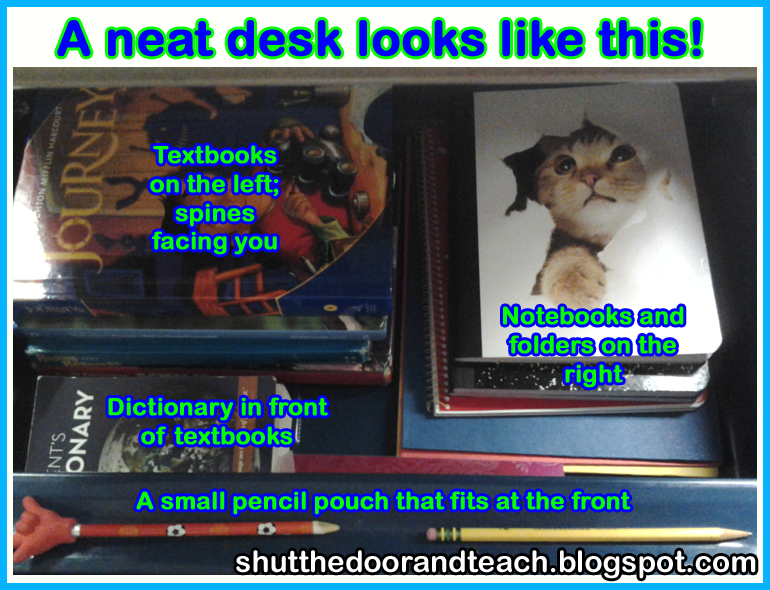 I saw a great idea on Pinterest (from Angela Watson from The Cornerstone) about a diagram of the inside of a neat student's desk. I thought since models are a great way to teach, and organization is a skill kids need to learn, this would be perfect! 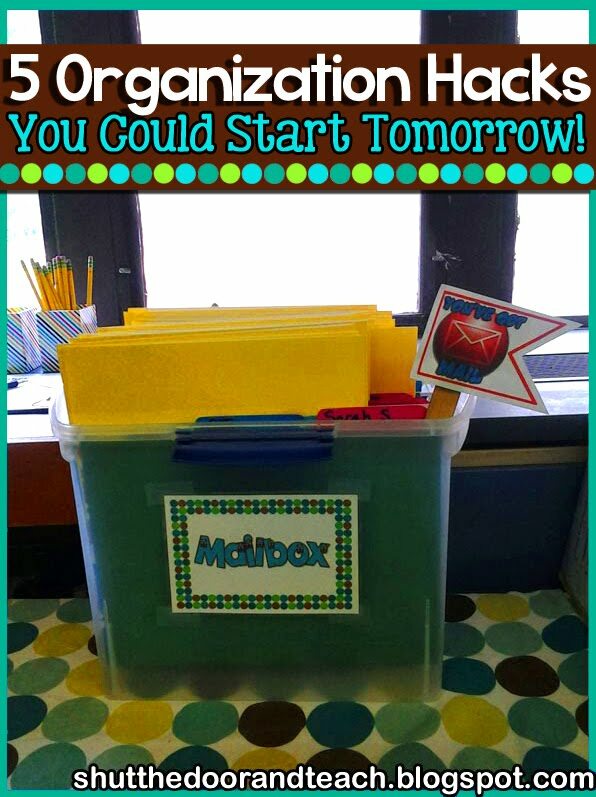 I created this to post on our classroom blog. 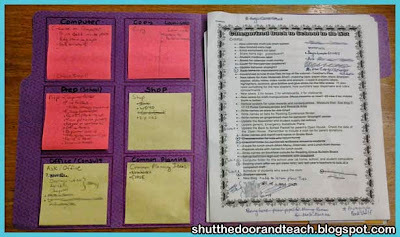 I WISH I could project the image, but instead I use checklists for individual students who need the extra help. I saw the "Print, Copy, Prep" Sticky Note in a file folder idea on Pinterest and knew I had to try it. I actually changed up the categories a bit so that they work better for the way I think. 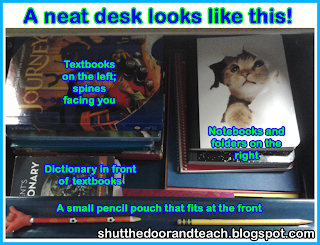 For example, I don't usually list what I need to copy; I just put them in a specific letter tray on my desk. Also, I like having my tasks separated by where they need to be done. 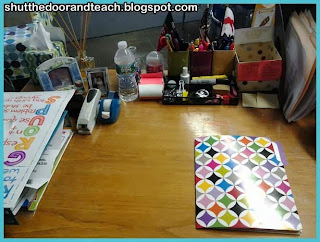 I love thatI can put those important papers from the office into one folder to deal with in time, and I can even throw the folder into my bag in the evening if I need to. It's keeping my desk neat for maybe the first time! And if you're wondering about the folder, it was very reasonably priced at Target over the summer. Hi! Found your post on Pinterest. Thank you for sharing these ideas. A suggestion for the Parking Lot: instead of 'off task,' maybe 'off topic' would be a better way to phrase it/more accurate? I might modify this idea for my own classroom. Thanks for sharing! I can't tell what the categories on your post-its are exactly. Would you mind sharing them? For the Parking Lot...what about "Extra Thoughts Parking Lot"? Ooh, I like this idea! Or "Related Thoughts and Other Questions." Yes, that's the sort of thing I was trying to think of! Thanks! How about labeling your chart "connections"? I like this idea too. "Connections and Questions" is kind of catchy!